Who shouldn’t read this book? What questions does this book raise for the EA reader? You’d spend your time hunting, gathering, or farming, using almost all your energy just to stay alive. Despite this effort, you’d eat the same food almost every day, and that food would barely be edible by modern standards. Your only defenses against illness would be herbs, bed rest, or surgery performed with primitive tools and zero anesthesia. You’d sleep when the sun went down -- light was expensive. And you’d probably die before the age of 60. Source: Our World in Data, Roser 2016, based on data from the World Bank and from Maddison Project 2014. Humanism: The Enlightenment created a new system of morality: one which “privileges the well-being of individual men, women, and children over the glory of the tribe, race, nation, or religion.” This humanism has taught us to tolerate and care for each other to an ever-greater degree. In the process, war, slavery, and capital punishment have withered to husks of their former selves. Progress: In Pinker’s view, the Romantics of the 19th century (and the despots of the 20th) believed in twisting people to fit their ideals. But Enlightenment thinkers preferred twisting their ideals to fit people -- they tried to build a world more suitable for humans. In universities, governments, and markets, they created norms, laws, and machines that made our lives better in a thousand different ways. The Romantics sought “utopia”, but Pinker sees the goal of Enlightenment as “protopia”: we may not perfect the world, but we can always improve it. New discoveries produce wealth, which can be used to fund more discoveries. Some discoveries help us communicate globally, increasing our tolerance of “strangers” who no longer seem strange. Wealth also makes us more tolerant. Nations with ample resources can afford social welfare programs and even the provision of aid to strangers in other nations. In a steady progression of strikingly similar graphs -- lines moving up for good things, down for bad -- Pinker shows that in the last few centuries, we finally escaped from stagnation. Human life has gotten better in almost every way, from a twenty-fold rise in average income since 1800 to a 50% reduction in young children killed by disease since 2000. Lethal lightning strikes in the U.S. are down 97% since 1900. In fact, there’s been a sharp decline in deaths from falls, fires, workplace injuries, and most other “accidents”. Our longer lives are due partly to medicine, but also to laws, regulations, and norms which promote safe behavior. Note: Pinker often focuses on the U.S., though historical trends are broadly similar for other developed countries (and many that are still developing). Deaths from natural disasters have also fallen drastically. Our wealth and knowledge give us innumerable small ways to defend ourselves (better hospitals, tougher structures, better early-warning systems, etc.). For an example of this, see Patrick McKenzie’s essay in “Further Reading”, at the end of this review. The average American has hundreds of hours of extra leisure time each year, compared to the early 20th century. This increase was driven both by shorter workweeks and by refrigerators, washing machines, and other appliances. Since 1900, we’ve cut weekly housework time in half. Thanks to this extra time, American parents -- both mothers and fathers -- spend more time with their children than they did a century ago. Pinker holds that these improvements, while often grudgingly acknowledged, aren’t taken seriously enough by the modern counter-Enlightenment. Populist politicians attack every pillar of our present-day prosperity. Thinkers on the left and right criticize the “complacency” of modern society. And the media skips boring good news to promote negative stories. Proposing a solution to these issues would require an additional book. Pinker mostly lets the numbers make his arguments for him, though he also addresses a few common counterarguments and pokes holes in his opponents’ logic. (When they even use logic, that is: one reviewer refers to Pinker’s numbers on violence reduction as “amulets” and “sorcery”). Pinker is a stylish, entertaining writer whose book tells a number of important truths. His main claim -- that the world is getting better -- generally seems to be correct, and he backs up his best points with blistering prose. But the claim isn’t universally true. And when the facts aren’t fully on his side, Pinker can descend into strawmanning and dodgy figures to justify his grand thesis. One of the weakest chapters in the Progress section deals with existential risk -- which seems highly relevant, since even centuries of progress could be undone by a disaster of sufficient magnitude. As he tries to persuade us that we live in the best of times, Pinker undersells two problems that could endanger civilization: nuclear war and the development of artificial general intelligence. He also notes that “if we can reduce the annual chance of nuclear war to a tenth of a percent, the world’s odds of a catastrophe-free century are 90 percent”, but never acknowledges that a 10-percent chance of nuclear war is still uncomfortably high. Finally, he points out the decline in nuclear danger since the end of the Cold War, but declines to mention new conflicts that could arise in the future; this is understandable, since he isn’t a military expert, but I’d have liked to see more evidence that our current low-risk state is stable. Still, he offers sensible proposals for reducing nuclear risk, and at least admits that the issue is worthy of attention. I left the chapter worrying slightly less about nuclear annihilation than I had before. As he did years ago, he continues to state that the AI safety community fears intelligent systems that are malevolent or omniscient. But the expert consensus is more subtle and realistic. Safety researchers generally believe that a powerful AI doesn’t have to be evil or all-knowing to be dangerous. It just has to be capable of pursuing goals that endanger humans with enough intelligence to accomplish those goals. He declines to engage with intellectual arguments about central topics like orthogonality or the control problem. Instead, he cites 2001: A Space Odyssey (as well as Get Smart, a shlocky comedy from the Sixties) as a counterpoint to Nick Bostrom’s Superintelligence. One of his few expert quotes is an out-of-context line from Stuart Russell, whose views on the topic are nearly opposite Pinker’s. In general, throughout the section, he selects weak points (some of which I’ve never seen argued by anyone in the community) and attacks their obvious flaws. In many other chapters, he takes time to find strong opposing arguments and make data-driven counterpoints; by comparison, the pages on AI feel rushed. Even when Pinker writes about present progress instead of future problems, some of the same problems emerge. George Monbiot’s deep dive on the environmental chapter found sketchy data and further out-of-context quotes. And while the numbers I spot-checked myself were accurate, some of them still had an odd spin. For example, Pinker argues that the true U.S. poverty rate has dropped sharply because today’s poor Americans can afford to buy more than poor Americans in past eras. This is true and important, but skirts other aspects of poverty -- feelings of inferiority, harassment by police, a lack of self-determination -- that haven’t necessarily changed for the better. That said, most of his statistics are solid and well-selected, and the data-heavy sections are by far the strongest. The book begins to flag when Pinker turns away from numbers and toward his critics; he’s not particularly charitable in the book’s more argumentative sections, rarely yielding to a single opposing point. The arguments also suffer from a simple lack of space. His critique of religion is shallow by necessity, since he can spare it only a few pages; the same goes for his critique of Romanticism, his critique of leftist academics, and so on. These sections read like newspaper op-eds; they’re fine, but they don’t give Pinker time to exert his full strength as an academic. I almost wish he’d turned the social criticism into a separate book. I’d prefer a version of Enlightement Now that focused entirely on material and social progress, with complaints about Donald Trump replaced by deeper explanations of counterintuitive statistics. If I had to summarize all my complaints, I’d say that Pinker tends to over-argue his conclusion. Is everything really getting better? 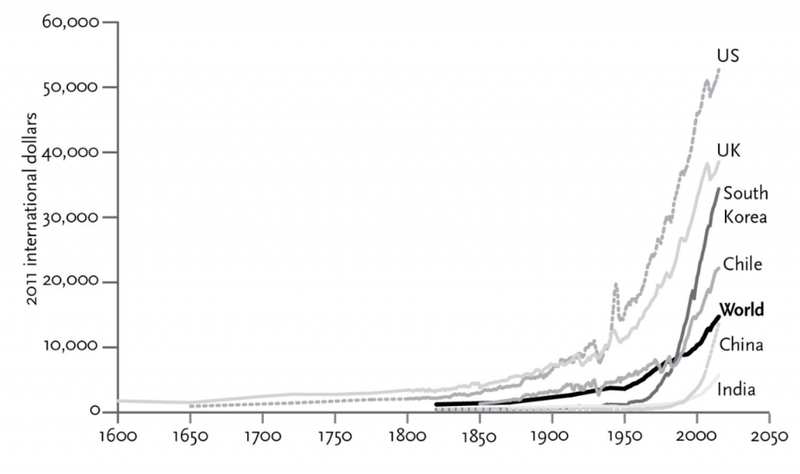 Are all risks truly decreasing? Is there really nothing of value in the Romantics and Postmoderns who followed the Enlightenment? Pinker makes a solid attempt to answer the troubling question at the heart of Yuval Harari’s Sapiens: “For all of our progress, are we actually happier?” He finds some evidence that rising wealth has made most of us more satisfied with our lives. And while he avoids eras of the deeper past (knowing how the ancient Romans really felt is beyond us), he points out that our ancestors also suffered from boredom and ennui and a lack of time spent with family, all of which I’ve heard cited as issues specific to us moderns. 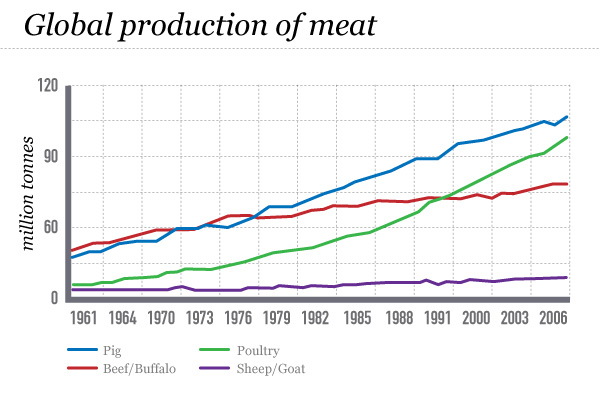 Source: The Food and Agricultural Organization of the United Nations. Pinker never tries to prove that economic growth will continue in the face of (theorized) technological stagnation, the aging of the developed world’s population, and the ever-increasing cost of research. This is harder to explain than the lack of animal welfare; economic decline could be just as dangerous as a nuclear exchange to Pinker’s “protopia”. Along the same lines, while Pinker praises the modern regulatory system, he barely mentions the costs. 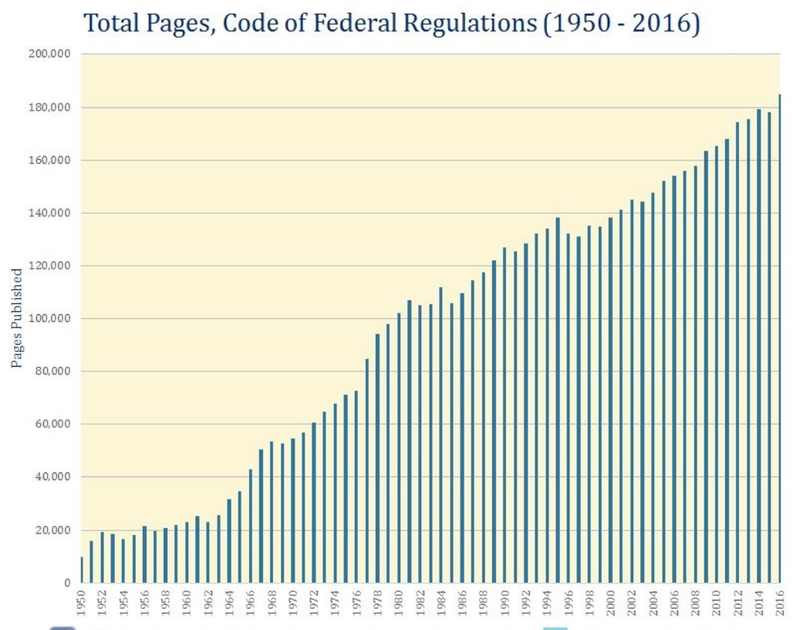 Regulation certainly saves a lot of lives, but it can also become excessive and slow down economic growth. Like health and wealth, regulation tends to increase over time; unlike health and wealth, there is such a thing as too much regulation. Source: George Washington University Regulatory Studies Center. Meanwhile, Pinker attributes the rise of scientific regulation, in the form of overly cautious ethics boards and bioethicists who slow medical progress, to the “stigmatization of science”. But another factor seems to be at work: have we not simply gotten carried away with our enlightened love of safety? Again, some of what Pinker defines as “anti-Enlightenment” just looks like an overabundance of progress. One last observation: Enlightenment Now has a lot more “now” than “Enlightenment”. As other reviewers have noted, the book is light on intellectual history. Pinker gives a brief tour of names and ideas, but barely mentions how those ideas developed over the centuries, or how the Enlightenment’s philosophy influenced the Scientific and Industrial Revolutions. (Did we need Voltaire and Mill to get steam engines and assembly lines?) His most important points still hold without this material, but I wish he’d done more to connect his four “themes”. In the end, I strongly endorse half of Enlightenment Now, tread with caution around a quarter, and would prefer the last quarter to have been published somewhere else. But the good material is often great, and Pinker’s occasional missteps shouldn’t obscure the beauty and joy of the facts he presents, which remain underrated. I’m glad we have him as a counterpoint to most of the media. Pessimists who don’t think the world is getting better and want lots of counterarguments. Optimists who like happy little graphs. People of any outlook who want a brief tour of the last two centuries from a materialist perspective, with lots of citations for following up. People who fundamentally distrust materialist perspectives. People who prefer a few deep arguments to many surface-level arguments. People who are familiar with this genre and don’t feel the need to remind themselves of all the ways things have gotten better. Here are a few that were on my mind after I finished. Your questions might be entirely different; Pinker offers a lot to think about. Given the massive historical gains driven by economic growth, might it be worth putting more EA effort into research on growth and development? If people really are more satisfied with their lives today than they were prior to the Industrial Revolution, how much of that satisfaction was dependent on material progress? Are there ways to capture similar life-satisfaction gains without an attendant order-of-magnitude increase in GDP? How many of the lesser-known improvements cited by Pinker might help us think about new cause areas? Or are there particular safety regulations that could massively cut down on some obscure cause of death like industrial accidents, and might be relatively easy to push forward? What could we learn from an Open Phil “history of regulation” case study? Civilization and Capitalism, by Fernand Braudel, explores human material progress in meticulous detail. (Braudel spends as much time discussing improvements in bread quality as Pinker does improvements in GDP.) The full book is free online, but you should start with this excellent summary. MIT professor Scott Aaronson’s positive and pessimistic review of Enlightenment Now (also linked above) includes a detailed critique of Pinker’s views on artificial intelligence. Tyler Cowen, economist and champion book-reader, wrote a brief and thoughtful review of Enlightnment Now. Nathan J. Robinson offers a detailed rebuttal of Pinker’s defense of inequality. (The rebuttal has its own flaws, of course, because everything is more complicated than it seems). Patrick McKenzie produced a stirring, detailed essay about the effectiveness of modern disaster response (in the specific context of the 2011 Japanese earthquake). One form of progress Pinker didn’t mention: The proportion of Wikipedia articles that meet a set of exacting quality standards has been steadily increasing for years. Many more forms of progress Pinker didn’t mention: Gwern lists the ways life has improved in the last three decades (the coffee has gotten better, for example). Our World In Data displays a set of surveys which show that most people are pessimistic about global development -- save for those in countries where the most development is happening, like China and Kenya. Nice to see a review of this book from someone I can trust to be unbiased about it. I don't think you can trust me to be unbiased, but I appreciate the compliment! I'm inclined, philosophically and aesthetically, toward the same generally science-humanistic views as Pinker. I found it helpful to read this review by an arch-conservative non-utilitarian, as a balancing factor. Thanks for a great summary Aaron, much appreciated! Will you continue to summarise EA-relevant books? My book list is too long for comfort! Book summaries are one of many CEA content projects; I'm not certain how much time we'll devote to them going forward, but we'll certainly take your feedback into account! Sloppy scholarship. Please do take a look, if you have a moment: https://www.salon.com/2019/01/26/steven-pinkers-fake-enlightenment-his-book-is-full-of-misleading-claims-and-false-assertions/. Did you have other criticism of the book beyond that chapter that you felt I should have pointed out?